What dramas are currently hot and which are not? 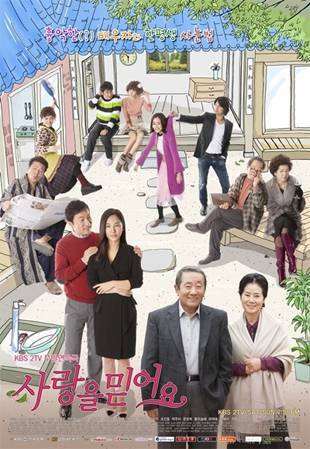 Well, according to reports on the viewer's ratings on various Korean dramas currently airing released on the 23rd, KBS 2TV's weekend show "Believe in Love" had the highest figures. The ratings for this past episode which aired on the 22nd garnered 27.5%. This was a 6.1% drop from the day before which saw 21.4%. The storyline for the 22nd was about "Myung-hee" (played by Han Chae-ah) accepting "Chul-soo's" (played by Cho Jin-woong) proposal. "Myung-hee" comes running into the house in excitement. After hearing her news, "Yoon-hee" (played by Hwang Woo-seul-hye) feels jealous and seeks out Woo-jin (played by Lee Pil-mo). "Yoon Hwa-young" (played by Yoon Mi-ra) just happened to be at the right place at the right time and thus dangers the couple from being outed. Comparing the drama to some other contenders, MBC TV's "Twinkle Twinkle" received 19.5% of viewer's ratings while SBS TV's "My Love By My Side" saw 7.7%.